At the individual level, honey bees have not one but three types of colony members: queens, drones and workers, each with their own specialisations and place in honey bee society. The queen reigns over the nest, surrounded by attendants and fed the rich food she requires to perform her few but crucial tasks in the colony. The queen produces powerful pheromones, chemical signals to recipient workers which control many of their behaviours and provide part of the 'social glue' which holds honey bee life together. A highly organised social structure exists within the colony and elaborate 'dances' are used to communicate the location of food sources. 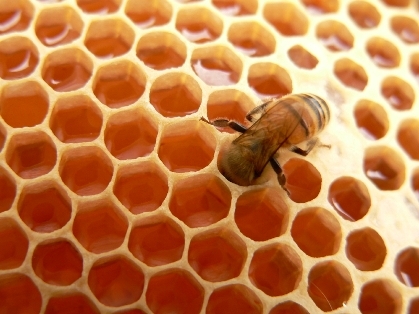 Honey is a remarkable viscous liquid, prepared by the bees from the nectars of various plants. It has occupied a prominent place in traditional medicines throughout world history. The ancient Egyptians, Assyrians, Chinese, Greeks and Romans employed honey for wounds and diseases of the gut. When the Children of Israel were in Egypt or journeying through the desert, their promised goal was a 'land flowing with milk and honey'. 'And thy Lord taught the bee to build its cells in hills, on trees and in (men's) habitations..... there issues from within their bodies a drink of varying colours, wherein is healing for mankind. Verily in this is a Sign for those who give thought'. The reader may be surprised to learn that the above quotation from the Qur'an is mentioned in a well known encyclopedia on honey (reference 3). At a concentration of 40%, honey has a bactericidal effect on various gut bacteria known to cause diarrhoea and dysentery such as Salmonella, Shigella,enteropathogenic E. coli and Vibrio cholera. In one study, honey given with oral rehydration fluid was shown to reduce the duration of bacterial diarrhoea in infants and children. Honey is widely available in most communities but its medical potential remains grossly underutilised. Its mode of action remains incompletely understood and the healing properties of honey in other clinical and laboratory situations requires further evaluation. The miraculous beneficial properties of honey, so beautifully ex-pressed in the holy Qur'an and Sunnah 14 centuries ago expose the reluctance of modern science to accept and exploit this 'traditional remedy'.